Canoes and putt-putt motor boats that went no more than a few miles an hour were the only boats on Kauneonga Lake when I was a child. My friends and I loved to go canoeing. It was such fun. We did not wear life jackets then. We would just get a canoe and paddle. Our favorite spot was to skim over the water and enter the channel so we could canoe on Amber Lake. It was ever so peaceful there. As times changed, boats got bigger. Sometimes when we canoed, friends would come by and purposely swamp us. There is nothing like sitting is a sinking canoe. We would jump out…abandon ship…then turn the canoe over and lift it over our heads as we headed to shore. I hated being swamped!!! Those boys! But those boys with motorboats were my friends, and we often went out with them boating around the lake. Canoeing was disappearing. Water skiing was becoming a big deal. And, although I never skied, I was often the spotter, yelling when the skier fell into the water. This time on the late was still wonderful as only a few motorboats were out. After I moved away from the New York area, my Dad decided that he needed a boat. My Mom was ambivalent on this purchase. But since a friend of theirs, my Dad’s best friend, sold them his old boat and trailer for all of $1.00, my mother could not say no. 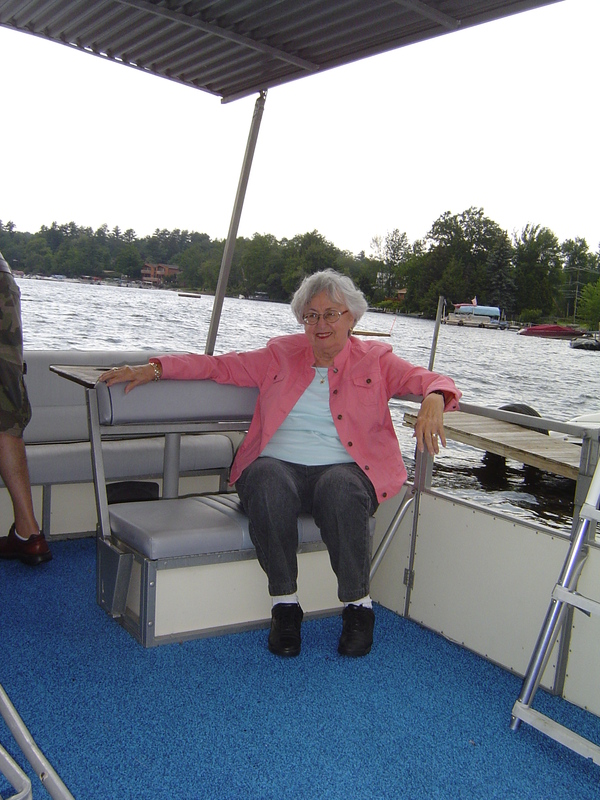 Mom enjoying the breeze on the pontoon boat. Luckily our waterfront property and dock is and was very close to my cousins, both of whom are engineers, and very loving nephews. They, and later their sons, were my Dad’s support. I think they had special alert when my Dad took his little putt-putt boat out on the lake. Whenever we were out, within 15 minutes, one of my cousins would boat up to us and make sure everything was going well. And then they stayed out on the lake. Why? Because every once in a while, it felt like almost every time, my Dad’s boat would stall in the water. One of my nieces believes she will carry the emotional scars from a water stranding rescue forever. She was so embarrassed that her cousins had to tow the boat back to the dock. For years later, whenever my Dad would say, “Let’s go for a ride in the boat,” she would try to hide. My Dad’s dream boat was a pontoon boat. And eventually he sold his little putt-putt boat and purchased an older pontoon boat. He worked on that boat for as long as he owned it, replacing so many parts and making it presentable. He just loved it. As did my Mom. They would go out on the Lake and slowly peruse the sites. 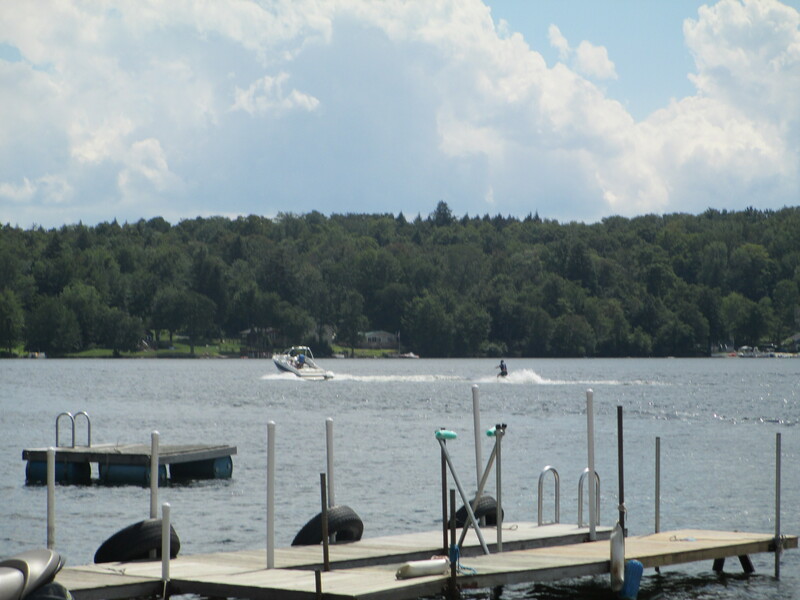 They would watch the skiers and the tubers and the people on jetskis. They would wave to friends. 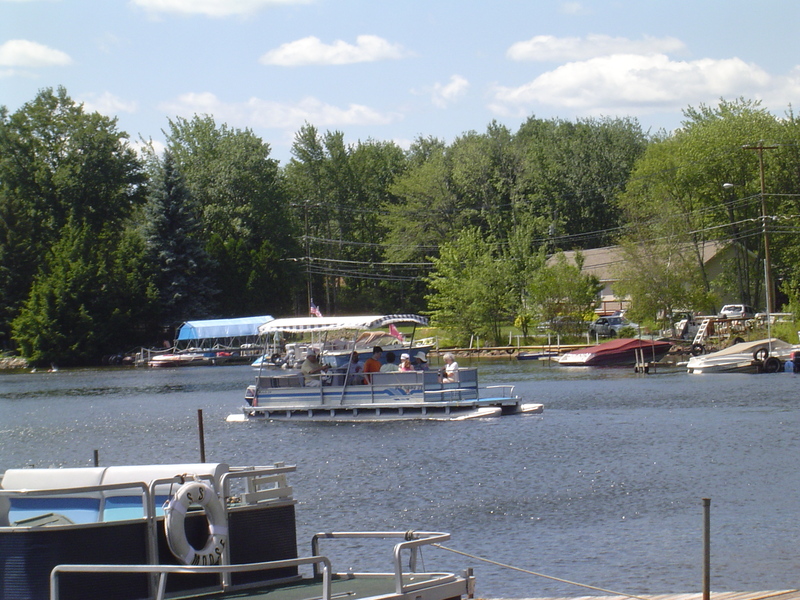 In their pontoon boat, they would meander around the lake and enjoy the breeze of the lake. They enjoyed taking their friends, children and grandchildren out. It held many more people than the little boat. And I do not remember it ever needing to be towed back to shore. But my cousins were always there when the motor would not start, or a plug came undone, or my Dad just could not get something to work. Thank goodness for my cousins! We eventually told Dad that he should only go out on the Lake when my cousins were up. And we think when he was 80 he listened to us. My Dad driving his pontoon boat on Kauneonga Lake. They were blissful days. I still see my parents’ smiles as they roamed Kauneonga and White Lakes in their pontoon boat. I hear the laughter and joy of the grandchildren. I see hats blown off into the water, and the exciting water rescues to get a hat back. I have such joyful memories. My Dad sold his boat the summer before my Mom died. It did not matter, he never spent another summer there. My cousins still have boats and jetskis on the Lake. When I go up I spend my sunny days with them by their beach and docks. We have not put our dock in since my parents passed away. But when I go on the lake with my cousins, part of me is looking for my Dad’s pontoon boat. Another part of me is laughing as we zoom around the lake and talk about all the changes that have occurred in the past year or so. Most of all, when I am out on the Lake, I think of all of our happy memories. How lucky we were to spend our summers there. And how lucky we are to be able to share that time with our children. Summers at the lake are the best summers.